Do you ever wish you could watch your favourite English TV in Germany? There’s not much I miss about home outside of family, friends and the occasional Chicken Tikka Massala. Everything else has a good enough Germany equivalent. While German TV is okay, it’s not exactly on par with what you’re used to back home. No matter how many Tatort episodes you watch, it’ll never quite be Sherlock or 8 out of 10 Cats will it? Well thanks to the power of VPNs (Virtual Private Networks), you can cheaply and easily get access to all of your favourite English TV shows in Germany in just a few clicks. What Is A VPN (And What Does It Do)? I’m not going to bore you with all the technical details. Instead, I’ll just say that a VPN (Virtual Private Network) routes all of your Internet Usage through a private server, which is often in another country. It means that your browsing history is hidden and hard for prying eyes – such as hackers and governments – to see. Meaning if you’re in Starbucks on their WiFi, nobody can get their hands on your bank details. If you look at my Tunnel Bear Dashboard here, you can see that I’m currently sat on my WiFi here in Cologne, without using a VPN. Now my data is encrypted and safe through a secure server and I’m able to view all of the websites in England as if I’m back on my Mum’s couch in Salford. Which brings me to the main point of this article, how do you watch English TV in Germany? If you were connected in Germany as normal, and you were to visit the BBC iPlayer site, you’d see a message like the one below. Or, in the case of some sites like All4, it would just freeze and nothing would play. Meaning you’re now able to view all of your favourite English TV in Germany through their online streaming service. This works for all streaming services in the UK too. But, before you go ahead and get yourself a VPN service – I highly recommend Tunnel Bear – let me answer an important question. Is all of this legal? Is It Legal To Use A VPN In Germany? A VPN is completely legal to own and use. There are no current laws against encrypting and masking your internet usage in Germany. Which is the primary focus of the tool. Streaming this content is also, as of right now, technically legal as long as you’re paying for your German TV License (Rundfunkbeitrag). It is however against the terms of service for some services like Netflix. So while I highly doubt you’ll get in trouble for doing so, you stream through those services at your own risk. But you can rest easy in the knowledge that you wont have any men in suits knocking on your door for catching up on the latest episodes of Coronation Street. Okay, so you know it can be done, and you know it’s okay to do, so how do you go about doing it? 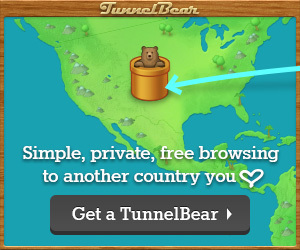 My personal favourite is Tunnel Bear.Because they’re cheap, easy to use and don’t come with all the frills that make other VPN services a nightmare to use. Because they’re cheap, easy to use and don’t come with all the frills that make other VPN services a nightmare to use, it makes watching simple. You don’t need to be a tech-whizz or understand what different servers and encryptions do. You just click the picture of the UK tunnel, get connected and start watching. Absolutely perfect, right? Heck, you can even try their free version to see if it’s for you. But, of course, you are free to try and make do with just German TV! However you want. Will this work if my tv isn’t a smart tv? If no, is there another device I can get to make it work? Hey Sheri! No, you’ll need to do this through a computer I’m afraid. If you have a modern laptop you should be able to get a cable that connects directly through a HDMI cable to your TV. Thanks for taking the time to post this. I‘ve been using TVexpat.eu for many years and whilst there have always been small hiccups, I‘ve quite happy with it in the main. However, (had to really stop myself capitalising that!) the last 3 months have been more than frustrating and I haven‘t warched at all for about 2 months. Thankfully it‘s summer so I don‘t feel I‘m missing much but I do want to watch ‚A Very English Scandal‘ which has had great reviews. I have duly downloaded ‚The Bear‘ (only the free version until I find out if, indeed, I can get it to work) and although I get a message saying my vpn is now in the UK I still get the ‚only available in the UK‘ message when in iplayer. Any ideas? Must add that I‘m a Luddite but my IT man has been round and also left scratching his head. Hope you‘re enjoying life in Cologne and have settled in well to your – relatively – new life. Nearly 25 years for me 😱. Just to confirm, using Tunnelbear allows you to watch BBC shows in Germany for free?